Airbus continues to perservere with its A380, convinced that the poor-selling giant will come good for use at increasingly slot-constrained airports. 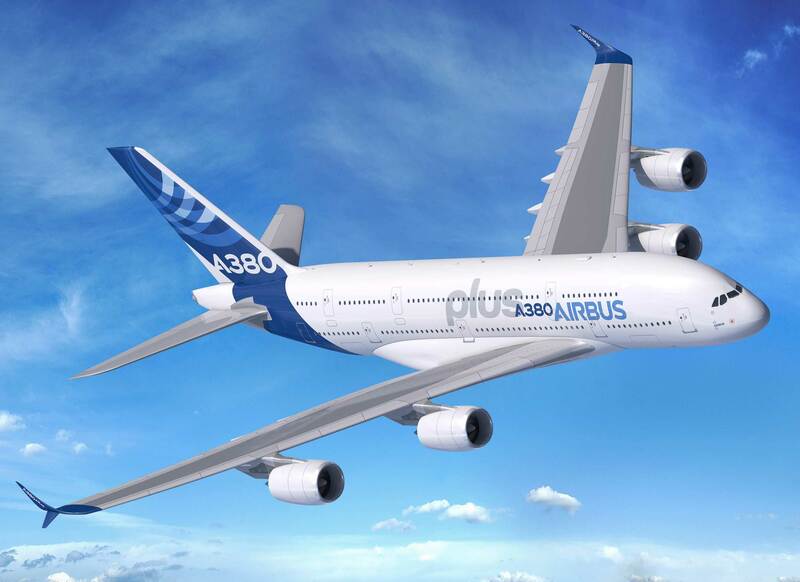 At the Paris Air Show which opened today at Le Bourget Airport, Airbus presented a concept for an enhanced ‘A380plus’. The study includes aerodynamic improvements with new, large winglets and other wing refinements that allow for up to 4% fuel burn savings. Added to an optimised A380 maintenance programme and cabin features first shown at Aircraft Interiors Expo (AIX) in April, the overall benefit is a 13% cost per seat reduction versus today’s A380. 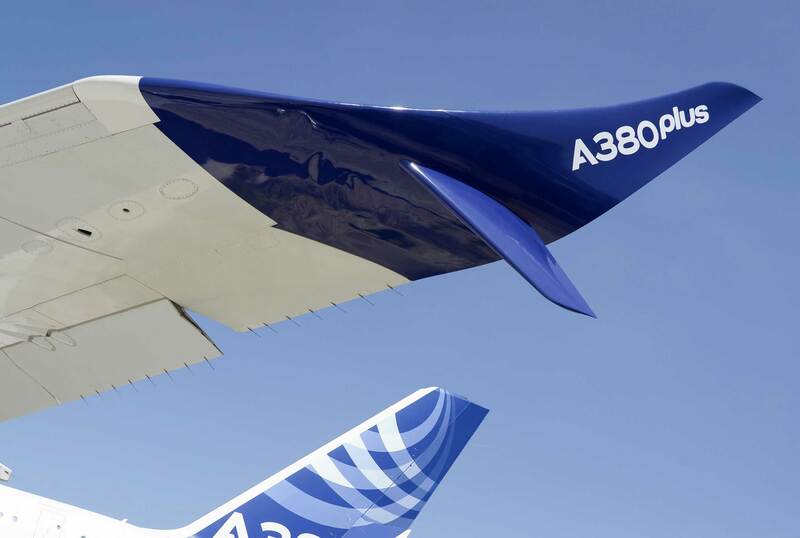 John Leahy of Airbus said, “The A380plus is an efficient way to offer even better economics and improved operational performance at the same time. The new winglet is approximately 4.7 metres in height (an uplet of 3.5m, and a downlet of 1.2m). It is designed to improve aerodynamics and reduce drag. The optimised cabin layout allows up to 80 additional seats with no compromise on comfort (says Airbus). Airbus has achieved this with redesigned stairs, a combined crew-rest compartment, sidewall stowage removal, a new nine-abreast seat configuration in premium economy and 11-abreast in economy. 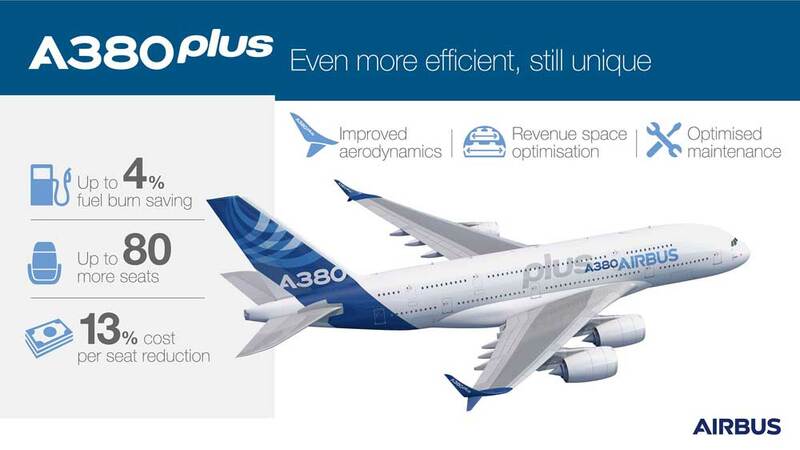 The current A380 has an average of 497 seats – this would enable airlines to up to 575 seats. Does an A380plus make sense?